Mary Catherine Kennedy, a registered nurse for over 50 years in the WNY community and a committed and active member of the DecideWNY Coalition. 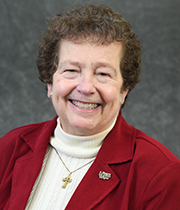 She is a certified Respecting Choices and Advance Care Planning Facilitator holding several informational sessions for her Parish as well as D’Youville School of Nursing. Click above to read more about Mary Catherine’s contribution to our community.